NEWTON, MASSACHUSETTS (USA) - Caliper Corporation has launched a new mapping solution for businesses and organizations around the world. Developed in response to the demand for a simple product to create and analyze maps and geographic information, Maptitude 2013 provides the access to location-based data and analysis that is increasingly critical to business today. Maptitude 2013 is a major new release. The features and enhancements (More...) enable you to create the maps you need faster, with higher accuracy, more attractively, and with better analytics. 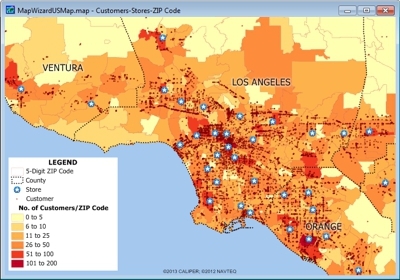 Maptitude 2013 has powerful tools and detailed demographics that enable organizations to leverage their data to improve customer and business location-based management. Caliper is excited to be able to bring the power and flexibility of our Maptitude product suite to a global audience and to enable our customers to make geo-location based decisions internationally. There are now 19 Country Packages available for Maptitude 2013! The countries covered include: 3 of the 5 fast-growing BRICS economies: Brazil, South Africa, and India; 6 of the Group of Seven (G7) nations, including the USA; and 12 of the Group of Twenty major economies, including Australia. Maptitude ships with one country of your choice (see complete list), and additional Packages can be purchased separately. Maptitude provides a way to extend the capabilities of business analysts. Despite the extensive functionality, a casual user can easily learn Maptitude. In most instances the software will automatically accommodate novice users, while providing experienced users with the flexibility to customize analyses and results. Maptitude is a capable mapping package and should handily meet the needs of all but the most esoteric applications. 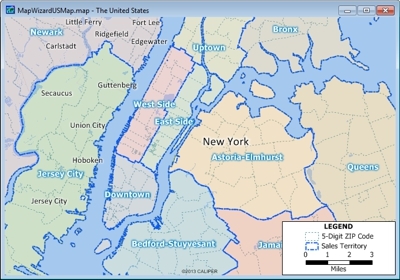 Maptitude remains the most competitively priced professional mapping software available and is unique in the marketplace for the provision of comprehensive data and functionality in a single product for a single low price (click here for pricing). If you have any questions about our product suite please call Maptitude Sales (USA) at +1 617-527-4700, or send an e-mail to sales@caliper.com. 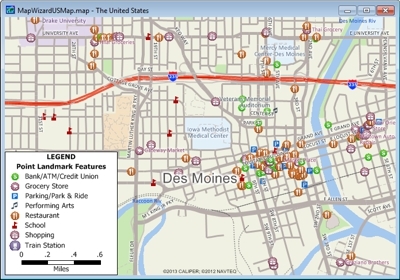 Locate unlimited customers and facilities on a map. Create and manage your territories with innovative tools and the ability to control overlapping service areas. Each Country Package contains detailed maps including business locations and demographics (where available). Add aerial images and plan routes with large numbers of destinations.